The three big ones were an HMG Porter Pack, a WM Super Ultralite sleeping bag, a Laufbursche UL mat plus a Thermarest Neoair Xlite Short topped off with an MLD Trailstar and a homemade innertent. My baseweight landed around 8 kilos compared to the 6,2-6,5 which is standard for me since a couple of years. This pack was way to big, and heavy, for what I would normally have used for a trip like this. I would probably have used my old Golite Jam 2 with a 52 litre capacity or maybe a GG Mariposa Plus with 58 litres. But the HMG Porter was newly acquired with longer, unsupported trips in mind and I wanted to try it out. It did not take long for it to become an appreciated companion. The Large version suits my ridiculous lenght (1,91 m) very well and it sat comfortably on my back with an initial 16 kilos (according to the scale in Kvikkjokk, it should have been 2 kilos less, have not had time to look at this discrepancy yet). The belt is soft enough on my bony frame, but gives the impression that it will manage a lot heavier loads (25 kilos according to some) without crumbling or becoming uncomfortable. But that is of course just guess-work. The HMG pockets I choose for the belt are fine for smaller items, however they are located on the side of the hip, which means that they are a bit of an obstruction for my arm swing if I walk without poles and they are full of, say, gloves and cap. 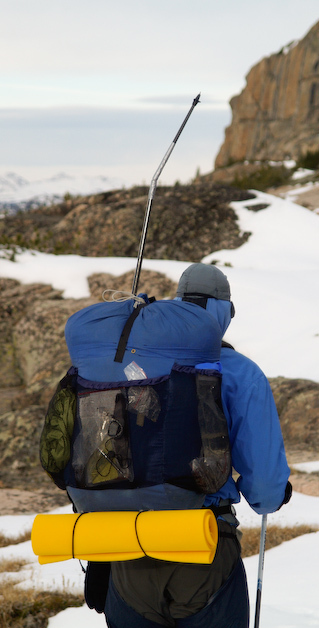 Since I hike with poles this was no problem, since my arms swing differently then when I walk without poles. The design of the pack is very clean, no outside pockets, which is something I like to have. But that is the design and there are lots of straps where you can attach all manners of parphernelia. I made a large outside pocket myself, more or less a copy of the one that HMG sells and added a couple of Laufbursche pouches as well. One of these extra pouches on the hip belt where I like to have map, compass and camera ready at hand. This worked very well. Another Laufbursche pouch held my rain gear on the outside of the pack and an old GG pouch did similar duty for my cup and snacks. In the big homemade pouch I stashed my tent, outer and inner, plus Goretex socks and some other wet stuff that I do not like to have inside the pack, wetting everyting. I am rethinking this whole pouch system, I will likely make a pouch for the side of the pack where I can stash the tent, putting the weight of these items closer to my center of gravity. We'll see. 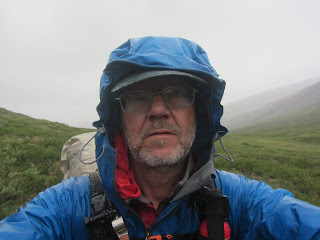 It did not rain much during the Sarek trip and the pack did not show any evidence of leaking (it is marketed as water-proof), but I do not care (nor believe) that the pack really will be waterproof in the long run. I still pack sleeping bag and clothing in two separate, sturdy dry bags and the rest of my gear can stand water or is separately waterproofed in other ways. The biggest disadvantage with waterproof packs, IMHO, is that it is not very easy to avoid putting wet gear into them, which takes away much of the advantage. There used to be a lightweight pack made entirely of mesh, that is more my kind of idea. Haven't seen it for a number of years, it was made by a small US cottage manufacturer. I have used borrowed Trailstars all summer because the one I ordered on June 6 has still failed to materialize on my doorstep. This one I borrowed from my friend Jonas, since the other one that I borrowed from Johanna for Iceland is getting ready for the Te Araroa this winter. 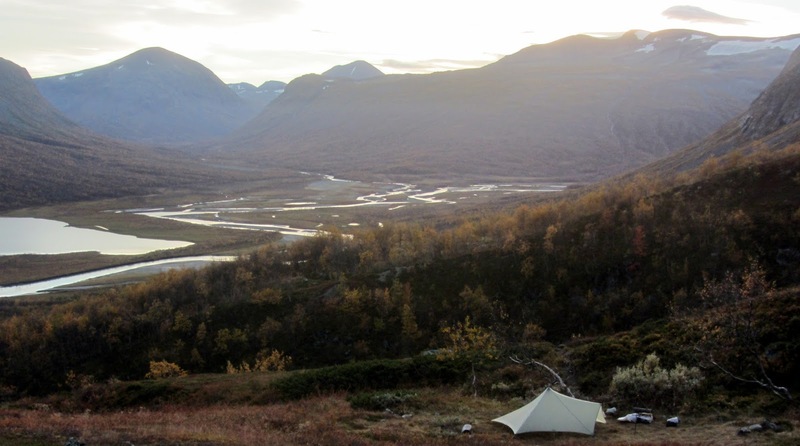 There where no winds to mention during my Sarek trip, but the experiences from Iceland gives me confidence in the Trailstar regarding this aspect. It is of course a remarkably roomy tarp for its 570 grams, easy and quick to pitch and the inner tent that I made from netting and Cuben fiber mostly, worked well. The nest weighed 230 grams, making a total of 800 grams. The weather was mild and damp which made for plenty of condensation and a thoroughly wet tent to be packed every morning. I only had one night of frost, giving a pretty sturdy panzer of ice on the fabric. The only drawback I have found so far is that the tent is slightly small for a tall person like yours truly. Particulary when sitting up. Even with a center pole at 1,25 meters I brush my head and upper back against the fabric while having breakfast. But this is less of a problem than it being to short while lying down, which it is not. One of those things that I always have to check live and which makes it difficult for me to shop tents entirely over the Internet. The homemade inner tent sports 0,5 m Cuben or ripstop (foot and head) at the lower part of the walls. The rest of the walls are light mosquito netting. Floor is Cuben as well. I will probably add some windproofing to the current 0,5 m, maybe another 0,2 m in places. When the wind switches in the night and blows right trough the opening of the Trailstar I think this will be needed. I had just a hint of this one evening, but the wind died down quickly. These 100 gram pants worked all right. I suppose they are designed for trail running and not for hiking. And as I have written before, I see them as successors to my BPL Thorofare pants that are showing signs of wear after a number of years of sometimes pretty hard use. For travels to and from trailhead I would have appreciated a bigger pocket on the Houdinis. There is only a small one on top of your right buttock. Big enough to hold a packet of cigarettes, barely. Not big enough for my plastic Zipper bag with money, tickets and cards. A pair of handwarmer pockets in front (like the Thorofares have) would also be nice. However, the Laufbursche pouches comes with a string and cord lock that makes it easy to wear them around your waist, so a pouch like that could be used for money and tickets instead of pockets. Being new, the DWR was at full flag, which made them a bit clammy on hot days (not encountered in Sarek, but I spent a couple of days of reunion hiking with participants from Coast2Coast Sweden 2013 and we had marvelous weather with frequent bathing along Bråviken on the Sörmlands Trail). The pants took quite a bit of bushwhacking in Rapadalen, equally shared with my rain pants, the Montane Minimus, to no ill effects. So, the Houdinis certainly will not be shredded at the first touch of some Salix shrubbery. They also dried extremely fast after fords. A couple of minutes after a knee deep ford they were only damp along the lower hem. 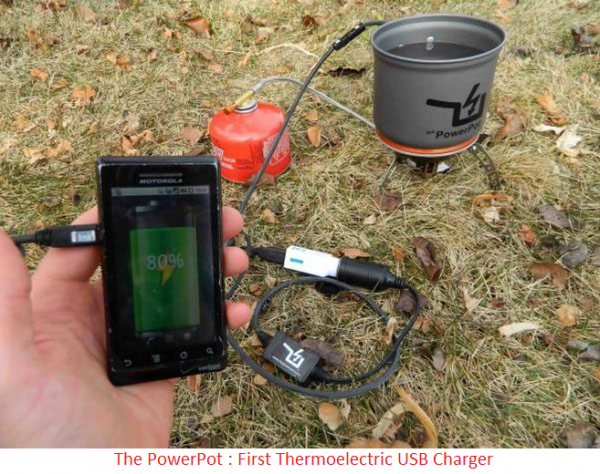 The Power Pot takes the energy from any heat source applied to its bottom and converts (some) of it to electricity that can be piped into cell phones, cameras and whatnot. The impression I got was that it took longer to heat a bit of water in the PP than in an ordinary thin-bottomed pot. I was also very interested to find out if fuel consumption had increased during this trip, after all, the electric power has to come from somewhere. If I know my Newton (Isaac, not Joe...). Coming home I could however see that my fuel consumption as usual for similar trips was around 25 grams per day (and person). This is by no means a reliable test, but for practical purposes it is enough for me. So it does not seem like I know my Newton or perhaps just that generating enough electricity takes very little gas. Now the number one question; did it charge my appliances. Well, so and so. 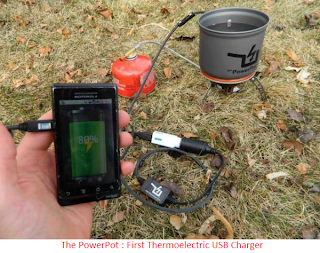 I almost exclusively used it for my GoPro camera and since the cooking I do consists of heating about 1 litre of water during the spread of a day, the periods of charging was limited to around 5 minutes during four occassions. How much this charged the battery I do not know, the battery seemed half full when the memory card was full. After a couple of days the light indicating charing on the PP cord stopped lighting up. This was after a period when the charging indicator light of the GoPro had also grown progressively dimmer. I do not know if the PP thermo electric element has croaked or if there is some remedy. I will check this. You are not supposed to cook in the PP, only heat water, but that does not work for me. However, everything that I cooked was of pretty soupy consistency and I suspect that the no-cooking caveat is due to the danger of the PP cooking dry. But I could be wrong. Due to this I have very little feedback on how useful the PP currently is in the field. Trials in the kitchen at home has indicated that it takes an awful long time to even partly charge a cell phone. It seems similar to my experiences with solar chargers. They do charge, but not enough to warrant their weight. Yet. The neat thing about the PP compared to similar products is that you can use it over a fire or any other heat source. Being able to use it with such an unlimited fuel source was what really attracted me, for really long trips. I doubt that I will use the PP much. I will probably, once again, retreat to using a number of extra, fully charged, batteries for my accessories since even a large number of these weigh less than power packs, solar chargers or power pots. So far. This will undoubtedly change in the future, but as usual, the future is not yet here. The GoPro that I had attached to one of my shoulder straps worked very well in an upside down, one-button mode. It was very easy to just push the button for a couple of seconds and get a footage of some nice scenery or dense shrubbery. Also easy to immediately get a shot of a moose, however the relatively wide angle (I used a Medium setting) lens left the moose pretty small on the screen. It seemed to use relatively little power, I brought an extra battery but did not need it. It seemed to have used up about half of the power in the battery I used during some 4 days. I only used it 4 days because I ran out of memory, having filled a 16 Gb memory card in that time. A seam broke on the back of my shoulder, but the windshirt is a sample run that I got from Haglöfs more than a year ago and hopefully the production run is better. The seam was easily fixed when I got home to my sewing machine. My shoes and socks special combo for the wet mountains yet again proved themselves. I use Salomon Tech Amphibs and thin nylon 'ladies ankle socks' from the grocery store. They are perfect for intermittent bog walking, drying out fast and comfortable on my foot. I brought a pair of Dry Max socks with Blister Guard technology that I have been trying out after the blisters I got on Coast2Coast Sweden in May. They worked very well on the hot, dry days of the reunion, before Sarek. However, when I got them wet they stayed wet and kept my feet wet for a longer time than my thin nylons, so I switched to these. When my feet got to cold I used Rocky Goretex socks and fleece inner socks off and on for a couple of hours every now and then. 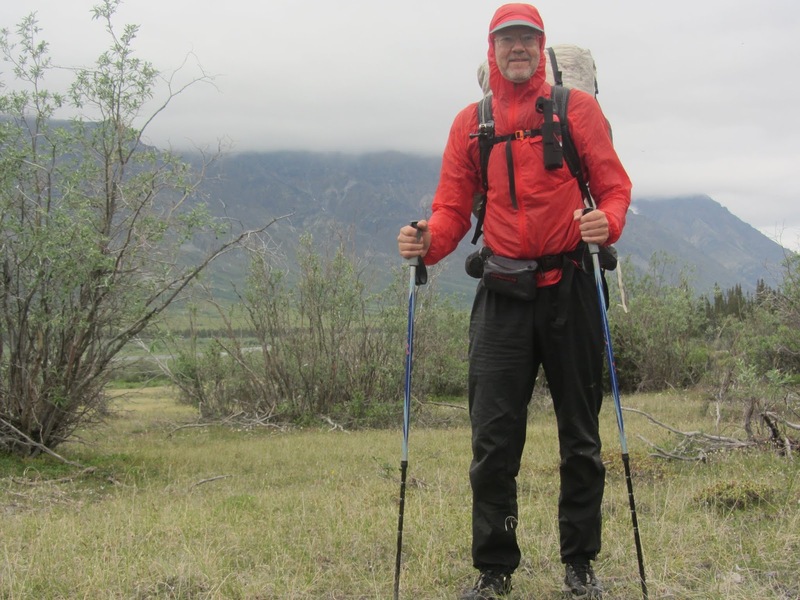 Last summers extremely cold, windy and rainy, hike along the border to Norway and subsequently along parts of the Nordkalotten trail made me rethink and beef up my clothing. I used to bring a short sleeve Icebreaker Kent Polo and a BPL Merino hoody. If hiking in the Kent, windshirt and rain jacket and pants was too cold I donned the hoody. This had always worked until last summer when I really had to use every trick in my book to stay reasonably warm. So for this fall trip, and perhaps even in summer in the future, I brought an extra Peak Performance Lite Micro thin fleece T-zip (190 grams) sweater and an Extremties Polartec Beanie (32 grams). They were both excellent additions leaving the BPL hoody for night use and as a backup against really nasty weather. Another favorite has the Laufbursche UL mat become. It is long and thick (195 x 49 x 0,9cm) and light (150 grams) and also of very high quality material that does not break or compresses into almost nothingness, as some pads I have used. I'll do a write up of the trip itself later on, maybe I will come up with some added gear reflections there as well. Discrepancy in weight, no matter how many times I weigh everything and add it up there is always a discrepancy. I also find the HMG hip belt pockets less than satisfactory, and can only be used for small items. 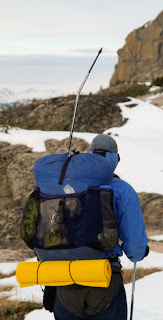 I use a set of Zpacks Top Side Pockets for pockets, but they are a little on the small side, however, a packed tarp tent sits nicely in it and is held in place by the side straps. As for socks, well I am sure of there is any simple solution, or combination. I have dug out my old wright socks, which are more comfortable (less constraining than my defeet ones) but on the beach they got sand in between the inner and outer layers, which took some removal. Overall tough my feet felt happier n them. I will certainly take a look at the Zpacks Top Side Pockets. I will probably make one or two side pockets for my shelter, thereby bringing them closer to my center of gravity. At the moment I believe that the light socks I normally use, which were perfect for Sarek when the thicker socks just stayed wet and kept my feet damper than the thin ones did, are perfect for cross country travel in tundra regions. For a lot of hard surface travel like Coast2Coast Sweden I think that another combination of shoes, socks and anything else that can prevent blisters is the thing. I will be researching and testing this for C2C 2014. Sorry for the tardiness of my reply Jörgen! I've used a couple of Haglofs pants for summer trekking: their Shield pants (not unlike the Houidinis you mentioned) are a straight up wind pant, very light, quick to dry but a little clammy. Then I bought a pair of their ultralight (214g) softshell pants (Intense I believe they were called) that I can no longer find in their catalogue. The Blasts seem to be the closest they currently sell (225g), but they've added Gore Windstopper panels, and I really don't like Windstopper because of it's membrane. A pity. None of these pants have sensible pockets, being marketed for trail runners who only need to carry a set of key. The perfect pants are a combination of these 'high aerobic' pants with just a few details from main stream trekking pants. Unfortunately an über niche market. I have the slightly smaller HMG pack, with a view to purchasing the 4400 model for winter/packrafting trips. I also opted for the waist belt pockets but find they are positioned too far back to be easily accessible. In future I would opt for no pockets and add my own after-market models. Unbelievably comfortable packs though. 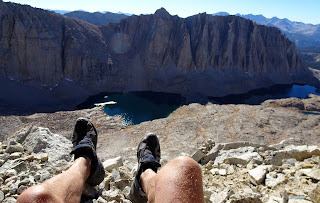 Yes, it is interesting that lightweight hiking pants (of course every producer claims that their 300 gram pants are ultra light...) are so difficult to find. But the impression that robustness is the same as thickness has been forcefed into the outdoor markets since the days of Jack London. I assume that is why outdoor pants made out of Kevlar and other materials a thousand times stronger than wool still are the same thickness as my old wool ski pants. Yes, the HMG was a great pack, would have been ideal for my packrafting trip down the Nahanni a couple of years ago. I bought it because I will probably need an oversize pack capable of carrying gear and two weeks of food next year. Joe, you loose. Nobody does tardiness like me. I eat, sleep and breath tardy! Jorgen, Weight discrepancy: I get it too but (if I read your text correctly in the other direction). KLM always tell me my pack is lighter than I think it is. Suits me. Providing a nice psychological boost on route to he trail head and keeping the cost down in these days of suplementary baggage fare. Where does it come from? I don't know either but I think it's a least in part the inaccuracy of kitchen scales and then some rounding off errors. We gram weenies habitualy weigh all our gear bit by bit and tot it up. I've never tested this but I guess that my cheap kitchen scales are giving me systematicaly lower readings and that that, with 30 or 40 items, adds up to a large chunk of the Hanlon-klm irregularity. KLM on the other hand are probably also rounding of to the nearest half kilo.